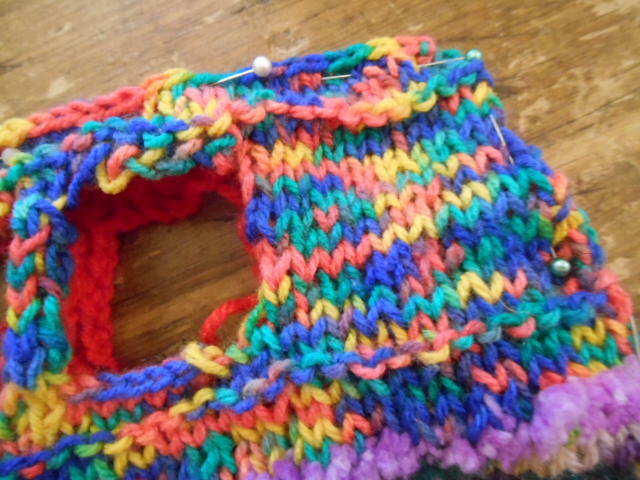 … and then made another piece in multi-coloured yarn for the inside. The Andersons have decorated their home very colourfully so I did what I could, with the colours I had, to reproduce their bus interior. 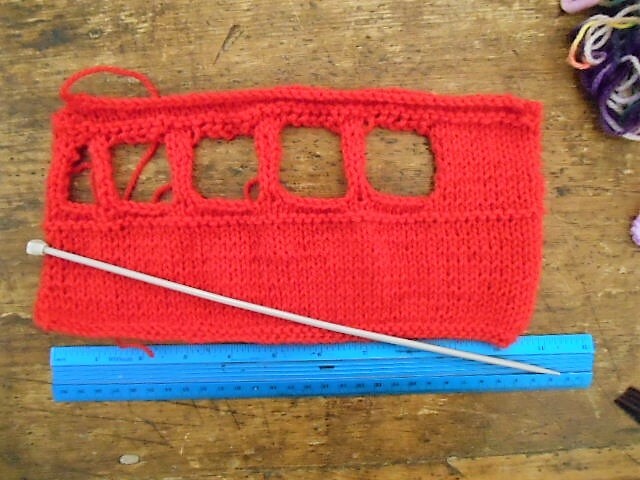 I ran out of bright red yarn, so I had to finish the outside of the bus in the closest colour I had which was a sort of burgundy. I decided that it didn’t matter because the colour of old buses does fade 🙂 Of course at this point I am not following the VW camper design, I’m trying to make it look like Old Red. The outside piece for the front of the bus includes the colours for the headlights, number plate, radiator and the bus number above the window. The Anderson’s bus has two headlights on either side so I sewed some white buttons in position for them. Unfortunately I don’t have any bright orange buttons for the indicators so I had to leave that for now. 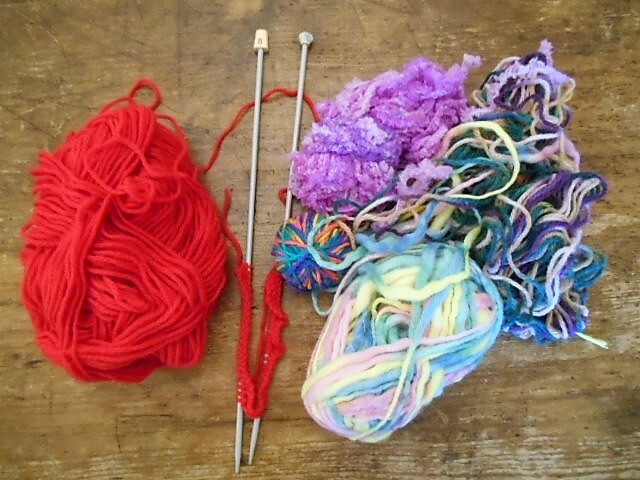 I might add those with yarn later. I added some black stitches to the radiator. Then it was time to start putting it together. 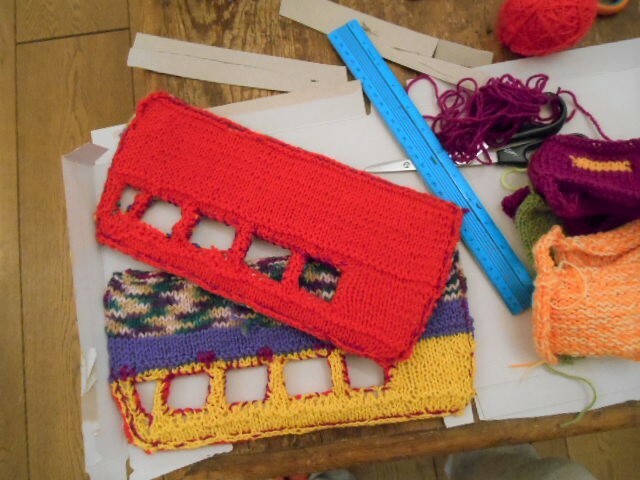 To make the bus rigid, the campervan pattern provides templates to cut out pieces of plastic grid to fasten between the knitted pieces, however I decided to make these out of card. 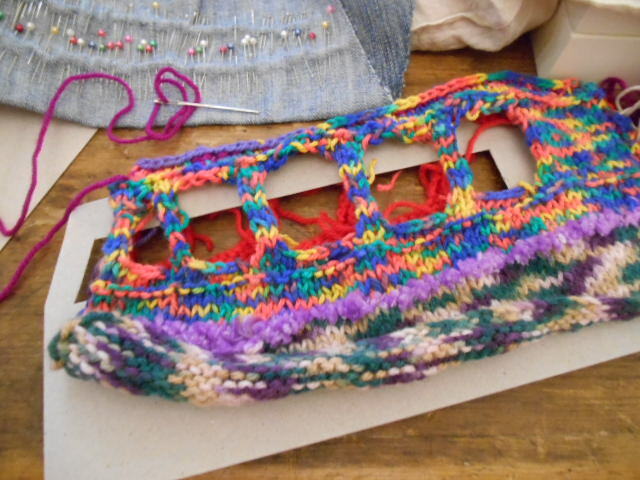 I flattened out a knitted piece as well as I could on some stiff cardboard, drew round it and cut it out. 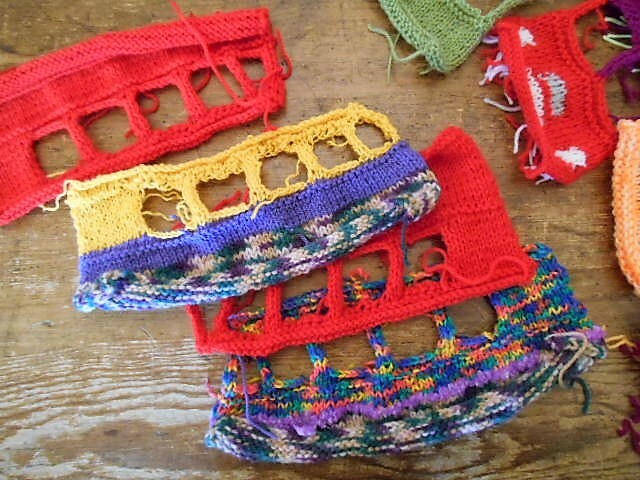 I didn’t cut out the individual windows, just one big window to go between the knitted windows. 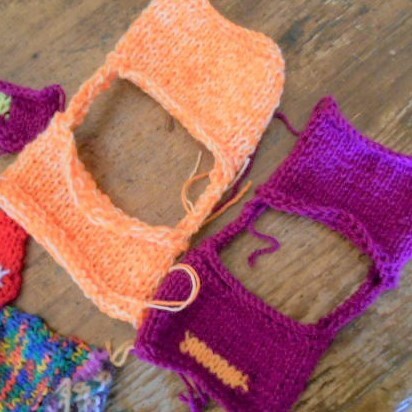 The knitted frames is all that’s needed to separate them. You’ll see what I mean. 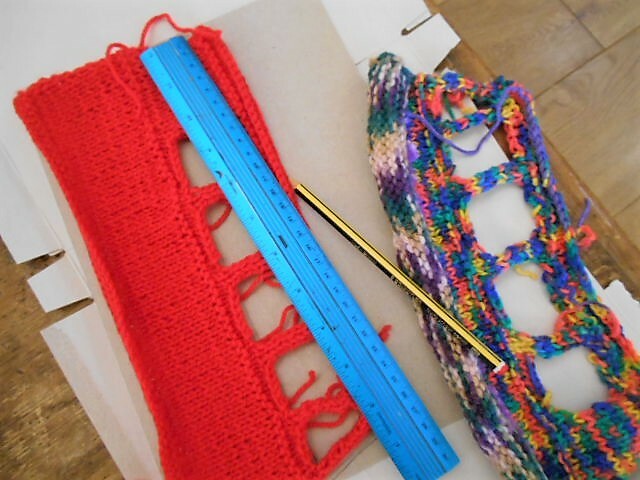 The cardboard inserts need to be sized so that the knitting needs to be stretched taut to cover them. I pinned together the top and one end of the inside and outside of one side of the bus with wrong sides facing together. Then I sewed it. Then I put the matching cardboard cut-out between them and stretched the knitting flat across it so that I could pin it in place at the bottom and opposite end. 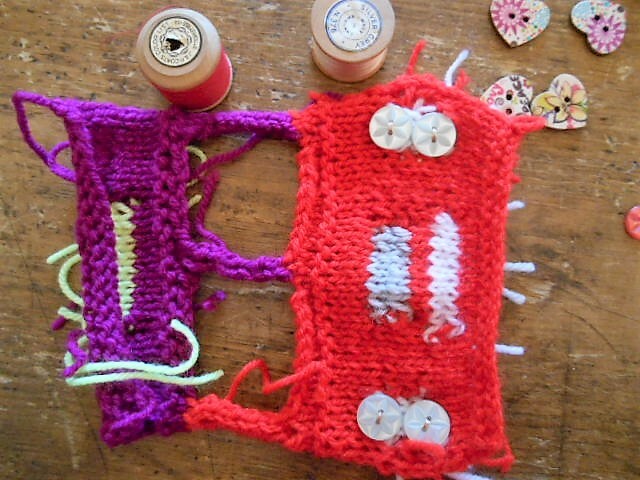 I finished sewing all the way round the outside and then around the window frames. 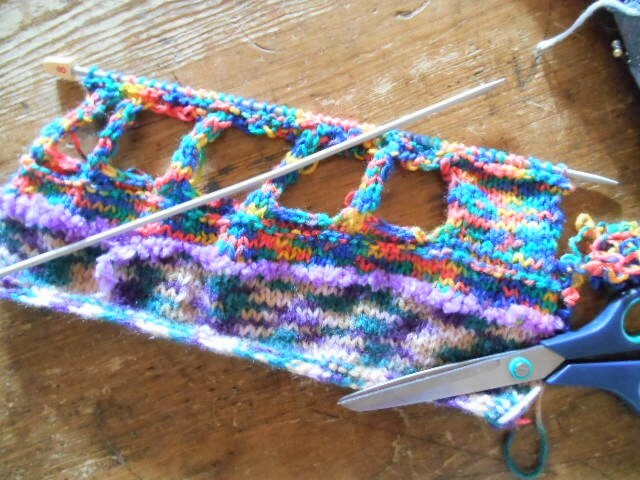 I sewed the inside and outside knitting of the window frames together, tucking all loose ends inside, out of sight. As I’ve said before, I am not neat at needlework, but that doesn’t matter. It seems to work out somehow. 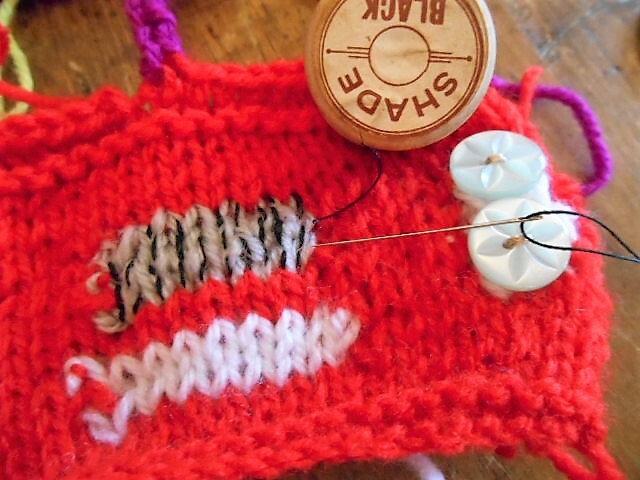 This entry was posted in Things to do and make, Vegan and tagged crafts, handmade, handmade toys, homemade, knitted bus, knitted toys, knitting, model bus, needlework, toys, vegan, vegan comics, vegetarian, veggie kids. Bookmark the permalink. I remember these buses. Yellow submarines too. This is so awesome. We have got to make this for our little travel van. Woohoo!! Wow, this one looks even more challenging than Reflecto Girl!!! But some can achieve anything they put their minds to! This is the most adorable thing I have ever seen! So cool! Amazing! Wow how exciting!!! 😀 I love it! I don’t know how you do it!